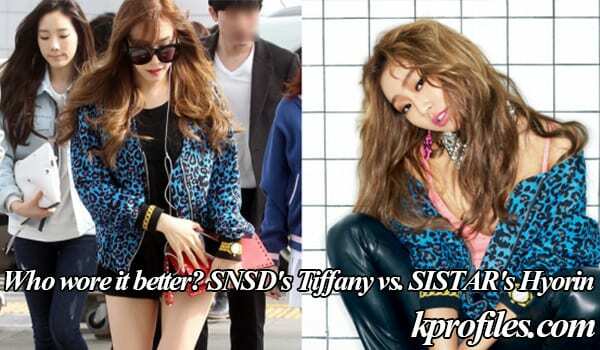 Today’s ‘who wore it better’ brings us two charming Kpop idols: SNSD’s Tiffany vs. SISTAR’s Hyorin. Both Tiffany and Hyorin wore a blue leopard print jacket from the Korean brand pushBUTTON, Watch Detail Blousson, which is currently sold for 998,000 won (about $924). Tiffany gives off a casual and feminine vibe, pairing the colorful jacket with black shorts, top, sunglasses and boots. The only colorful accessory she completed the outfit with is a red leather Rockstud Clutch bag from Valentino. Hyorin wore the pushBUTTON jacket in a photoshoot for the March 2015’s issue of Marie Claire magazine. She paired the jacket with bright colors – pink top, pink earrings from KatenKelly and shoes, a silver necklace from Black Muse, the only dark elements completing her outfit being a pair of black leather pants from Anotherman and a stylish Esenza L Quartz Touch Jubile Watch from Rado. Tiffany vs Hyorin: who wore it better? Out of the two, who wore better this fun, colorful jacket: Tiffany or Hyorin? Feel free to comment below. If you picked Tiffany, you’re lying to yourself.